Meet the hottest new UK breweries, as judged by We Are Beer and showcased at this year's London Craft Beer Festival. "You start out and someone will say ‘what you want is to put a nice big Welsh dragon on the front and you’ll sell loads of it’." Our journey starts in an industrial estate in the Welsh town of Swansea, with Richard Axon of West x Three brewing. Having very much enjoyed his beers at the recent Edinburgh Craft Beer Festival, I’m genuinely surprised and impressed by the tiny scale of Richard’s operation. In a unit barely larger than a garage is a Heath-Robinson collection of mismatched stainless steel, home-made electronic controls and a wood-clad brewkit which has been adapted from his old homebrew setup. A helicopter pilot in his day job, Richard started brewing at home while he was working for the north sea oil companies, ferrying people to and from the rigs. With two weeks on and two weeks off, he would spend his free time reading dense brewing tomes and ordering ingredients that would be waiting for him when he returned home. 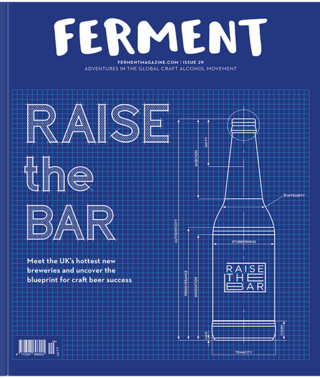 Richard’s passion for beer and home brewing was shared by his old school friend Hamish Thain, a successful product designer, and the two hatched a plan to take out a small, affordable space in Swansea and launch their own brewery, that they would run together in their spare time. While he acknowledges the work is more “a labour of love” than a slick, high-tech operation, he enjoys the engineering and problem-solving challenges the setup has posed. “It’s all a little bit home-made and borrowed, a lot of the tanks aren’t insulated, so they need a lot of attention. In the winter months we have to run heaters to stop the yeast from going to sleep. But I like the technical element of brewing and working out the fixes for the things that we have. It’s good to feel like we’re earning stuff rather than just buying it, if you know what I mean. Yes, our intention is ultimately to get a more sophisticated kit, but it’s not our focus right now. If what we do on this kit doesn’t resonate with people, then buying a £500k brewery isn’t going to change that,” he continues. The brewery tour over, we decide to head down to the harbour for a couple of samples at one of Richard’s favourite bars, Beer Riff. Also a brew pub, Beer Riff is in a great spot, with tall windows looking out onto the bobbing boats in the marina, cool wall art and a rocking playlist. It’s indicative of a relatively recent interest in craft beer that is now really beginning to take hold in Swansea. Richard says the biggest lesson of this journey has been getting the confidence to say no, and to plough his own furrow. “You start out and someone will say ‘what you want is to put a nice big Welsh dragon on the front and you’ll sell loads of it’. Obviously we didn’t do that, but I think when we started we were too eager to please everyone, and that meant making beers that we didn’t particularly want to make, and trying to do too much. After chatting for a while, Richard admits that another big distraction over the past few months has been a legal dispute with Glasgow’s West brewery, which accused West x Three of trying to piggy-back on its brand. He says he’s close to signing a deal that will mean changing his brewery’s name, but that he’s come round to the idea that a thoughtful rebrand could be a good thing long term. Although he’s relatively sanguine, there is also some clear frustration at the lost time, energy and legal fees incurred by the clash. On the way back to the brewery, Richard takes us past several sites he feels would be ideal for a new and improved home, and he’s excited about having space to invite more people in to experience what he and Hamish are creating. "When you start a businesses you’re going to be working silly hours and putting your absolute heart and soul into it. So you’ve got to make sure it’s something you really care about." Bidding Richard goodbye, I jump into my rented Toyota Aygo and head down the M4 to my next port of call, Unity Brewing in Southampton, and founder Jimmy Hatherley. With a strong focus on Belgian styles, Unity is one of my favourite new discoveries this year, so I’m excited about seeing it in person. The brewery itself is again a fairly modest setup from the outside, though definitely larger than West x Three, with space for more vessels and even a pop-up taproom a couple of days a week. Affable and charming, Jimmy is something of a craft beer veteran, having worked at London Fields in its early days, then hopping between several breweries in the capital. Even back then, the idea of starting his own brewery and building a craft brand was clear in his mind, and he resolved to put the time into honing his skills and learning everything he could about the industry. After working for a while in a couple of the city’s more traditional breweries and scratching his creative itch though homebrew, it wasn’t long before Jimmy decided to take the plunge and strike out on his own. A strong believer that new breweries should set off with a clear idea of their own brand and purpose, he reached back to his own beery awakening and subsequent homebrew adventures for inspiration. “I’ve always had a love for Belgian beer, and when you start a businesses you’re going to be working silly hours and putting your absolute heart and soul into it. So you’ve got to make sure it’s something you really care about. I knew I could probably make more money if I brewed a stout, a pale ale and an IPA. I knew I could be mainstream and go down that road, and make a 3.5% cask beer and all the rest of it. But I wanted to make sure that every day I’m brewing beer I really believed in. “I never really drank much beer to begin with. I used to drink Summer Lightning in the local pub because it had the highest abv per pound, not because I particularly enjoyed it. But my dad took me to Bruges and Brussels when I was 19, for a week, and I absolutely fell in love with Belgian beer. The three beers I took home from the trip were, Saison DuPont, Orval and Rochefort 8. I was like ‘this is great, this is beer’. So I trained my palate, learned more about beer and started getting more interested from that point. Jimmy admits it took a while for the Southampton locals to come round to the idea of Belgian beer, steeped as they are in British cask tradition. While most have heard of Belgian beer, they assume it’s all very high strength, so Jimmy has won them over gently with 4.2% Belgian pale ales (“before I hit them with a 10.5% quad”). Unity also brews a very quaffable American-style pale ale, to compete with Gamma Ray on the taps of city’s craft-friendly bars. While it’s not where Jimmy’s heart is, it’s a great beer and Unity’s best seller. Although one gets the sense that returning home was a bit of a shock after the craft beer buzz of London, Jimmy is positive about the direction in which Southampton is heading. “We’re part of something now. Southampton has the most micropubs of any city in the UK, and they’ll often stock our beer. It’s generally an interesting place. There’s a good music scene here, which I used to be quite heavily involved in, and it’s a big university town, so you get this kind of transient population, which has a big impact on nightlife. Jimmy hopes to increase Unity’s export activity next year, as well as expanding the brewery. Already brewing at capacity and with a new baby on the way, he’s planning on buying some extra tanks and hiring more staff to take some of the pressure off, before finding a more permanent new home in the near future. Like West x Three though, Jimmy’s ambition leans toward a different kind of success than world-dominating mega-craft. "Everyone was impressed with the beer and we were able to hit the ground running." The final stop on this journey across Britain takes me to my old stomping ground of Hackney, East London, to Boxcar brewery and its head brewer Sam Dickison. As seems to be obligatory for breweries in the capital, Boxcar’s home is a railway arch, complete with damp, exposed brickwork and tastefully rusted signage. It’s pretty cool. In the space of a short year, Boxcar has been championed by several movers and shakers in the competitive London beer scene, turbo-charging its success. Such patronage is well-deserved though; everything about Boxcar, from the beer itself to the eye-catching label design is superbly crafted. So, how did things go so right? Sam started his career at west London’s Moncada brewery, where he rose to head brewer, before taking on the same role at Hammerton brewery Islington. He then moved to People’s Park Tavern in Hackney for 18 months, during which time he dreamt up the idea for Boxcar with his friend and co-founder Stephen Finch. 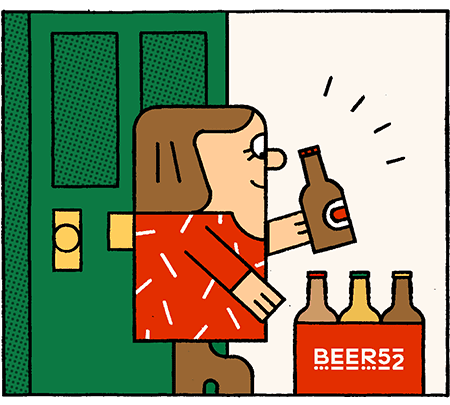 The pair decided to get the ball rolling with a tiny brewkit in a small arch in Homerton, “just to test recipes and figure out the brand, with the idea of eventually upscaling and building a proper taproom”. Handily, Stephen also runs Vagabond, a chain of wine bars that made the perfect low-pressure venue for road testing Boxcar’s inaugural brews. Craft Beer Rising 2017 was arguably Boxcar’s big debut, and as soon as Sam and Stephen began actively promoting their beer, it came to the attention of Mother Kelly’s, the highly-regarded group of London bars and bottleshops, which began placing substantial orders. For a start-up brewery, this is the best exposure one could hope for, and sales inquiries and invitations began flooding in. “I think that slightly more underground trialling period meant that when we did release, everyone was impressed with the beer and we were able to hit the ground running,” says Sam. “There isn’t really another brewery focused on the new style of IPA in London; the super-hazy, lower bitterness, yeast-forward IPAs… I’m reluctant to call them New England for some reason! I decided early that I really wanted to nail that style, though we’ve also released a stout and a saison." Rather than lock down its core recipes and aim for complete consistency, every beer that Boxcar brews is currently slightly different, as Sam experiments with different yeast combinations and whatever hops take his interest. While the approach is a little unconventional, this constant refinement has led Sam to a yeast combination that has since been adopted by at least three other breweries for their own New England styles. Barely able to meet its existing commitments, let alone take on new customers, Boxcar’s next move will be to a larger site with higher capacity kit. At the time of writing, Sam is about to sign on for a double railway arch in the up-and-coming craft beer hotspot of Bethnal Green, with around four times the floor space. As well as the extra space, Sam is clearly excited by the prospect of being in Bethnal Green at the start of what he believes will be a significant new craft centre for the London scene. A couple of minutes from Mother Kelly’s Bethnal Green, Renegade urban winery around the corner, as well as Old Street brewery and a couple of other small breweries setting up within spitting distance, there seems to be real momentum. “It’s no Bermondsey,” observes Sam wryly, “but in a way it’s nicer to build a scene there I think”. Once settled into the new space with more sophisticated kit, Sam wants to begin experimenting with barrel ageing and brett. While he’s still exploring hop-forward beers on his existing setup though, his current obsession is table beers.